Series 1- Sea vs Shuttle: Looks like Shuttle got swept away! Game one (Fighting Spirit): Shuttle went for early pressure after his one gate expand otherwise it ended up being a macro game. Sea got an earlier third and there were many skirmishes happening. Sea seemed to have the better engagements though Shuttle's well placed storms helped him stay in the game as he was pushed to defend his 4th but he eventually cracked, lost his 4th and GG after losing the rest of his army at Sea's 6th base. Game two (Circuit Breaker): Sea opted for a 2 factory expand compared to Shuttle's one gate expand. The 2 fac caught shuttle off guard as he was forced to give up his expansion and was heavily contained despite trying to break out. Shuttle elicited to go for his expansion at the mineral only ferrying units using Shuttles. He eventually manages to break the contain but his second now comes under attack. He manages to lose this base as well. At this point, Sea is up to 3 bases mining while Shuttle is establishing his 2nd and 3rd again. Sea's final push to Shuttle 4th (he triple expands) causes Shuttle to GG with Sea going up 2-0. Game three (Blue Storm): Sea goes for a factory expand compared to Shuttle who goes proxy robo into expand. This is scouted by Sea. Sea managed to establish his third after getting Shuttle to retreat his goon force. Sea started dictating the pace of the game at this point. Another attack on Shuttle's second, taking a fourth base to be on par with Shuttle's eco and constantly repelling Shuttle's carrier fleet while taking down lots of probes at Shuttle's 4th base. Despite Shuttle's best attempts, Sea was eventually able to muster a big enough goliath/tank force (pic) to contest Shuttle's goon/carrier army to take the win and the clean sweep. That is many goliaths, yes? Series 2- ZerO vs sSak: ZerO is no more! Game one (Fighting Spirit): sSak attempts a forward 8 rax which is shut down by pool first from ZerO. From this point on, Zero took control of the game. Running zerglings into sSak's main while attacking his expansion with mutas, keeping him a bit contained with lurkers etc... However, sSak would have none of that as he managed to push out and make his way to ZerO's expansion in record time. Defilers finished just as the last sunken was taken down and ZerO held on. During that attack, ZerO established his fourth while sSak started transitioning to mech (mass vulture style) and taking his third. ZerO held various engagements at his many bases and sSak gg'd after his army was taken out. Game two (Circuit Breaker): sSak opened 1 rax FE against ZerO's expansion first build. After going up to two raxs and making a small MnM force, sSak went for the usual small attack though he circumvented ZerO's overload watching the usual path and came in from the bottom. This caught ZerO by surprise as he quickly made two additional colonies (he had one, pic). 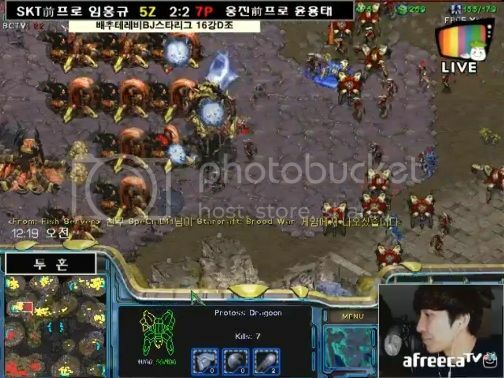 It was too late though as sSak's army easily took out the colonies, zerglings and lots of drones promoting the GG from ZerO to tie up the series. Game three (Blue Storm): sSak showed that he can make any strategy work as he went for an early ebay expansion block at ZerO's natural forcing ZerO to pull drones and go for pool first. He ended up going one rax and adding another rax with a factory while trying to continue denying ZerO his expansion (another ebay block). ZerO was forced to go 1 hatch lurker on one base where the lurker attack got denied. sSak countered with MnM+tanks as he expanded and won. Game four (Neo Electric Circuit): ZerO went for a three hatch before pool build while sSak went for 1 rax FE. ZerO opted to go mutas keping sSak to his base. While sSak stayed on 2 bases, ZerO grabbed his 5th and 6th. sSak moved out looking to do some damage as he decided to take the inbase mineral only expansion but was stalled and pushed back due to dark swarm and lurkers at ZerO's 4th. sSak took another route through the backdoor (psi disruptor) and managed to take down ZerO's mineral only base (7th) and put his 4th under siege from the high ground (pic). 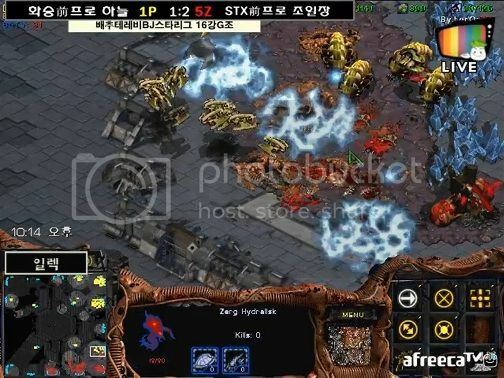 It was a bit too late though as ZerO was in a prime position to slowly push back sSak using constant zergling attacks, overlord drops as well as other tactics overwhelming sSak to win the game. Game five (Fighting Spirit): ZerO went for 3 hatch muta compared to 1 rax FE from sSak. As ZerO grabbed his third, sSak went up to 4 rax looking to hit a timing. As he moved off, he was stalled by mutalisks as ZerO tried to tech to lurkers. He would eventually succeed in doing so however once sSak gathered a sizable army, he eventually pushed to ZerO's expansion, took it out while he wiped out all of ZerO's workers at his 3rd (killed one lurker, passed others morphing). sSak started to transition to mech as more vultures were added into the mix as he grabbed his third. Things were looking grim for ZerO as he was getting stretched thin with vultures constantly harassing his 3rd and MnM+tanks at his expansion. After losing his workers again at his 3rd, ZerO calls the gg and sSak takes the series 3-2. Series 3- Mong vs Snow: Mong has been snowed in! Game one (Fighting Spirit): Mong went for 2 factory heavy vulture style compared to Snow going for 2 gate FE. Snow attacked into Mong dealing a lot of damage and even getting into the main scouting the incoming drop play. As both players established their expansion, Mong continued the heavy vulture style while Snow stuck to goons. 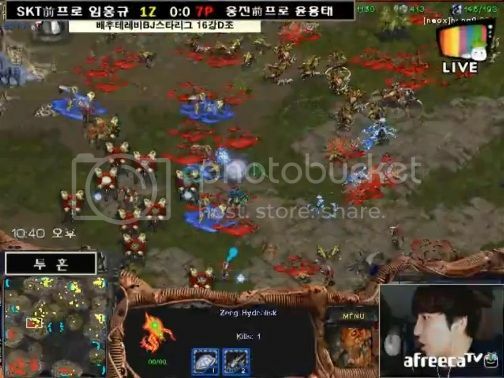 Snow's goon micro proved to be more than enough as he constantly caught and took out vultures before attacking Mong's expansion when obs were out to win the game. Game two (Circuit Breaker): Snow opted for nexus first. 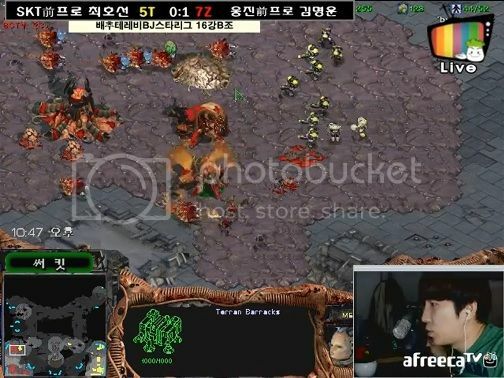 Mong responded by going for a bunker rush that saw Snow lose his nexus with Mong reinforcing his contain with spider mines and expanding behind it. Snow eventually broke out. As he established his expansion, Mong stayed ahead by grabbing his third and defending against Snow's reaver harass. Snow followed suit and grabbed his third as well. Fast forward to Mong grabbing his fourth, a double drop failing from Snow and Snow's attack on Mong's 4th also failing which gave Mong the perfect time to strike. With a 200/200 mech army on his side and a better eco, Mong slowly pushed Snow back to his third (pic) where he eventually sieged on the high ground and took the game to tie things at 1-1. Game three (Blue Storm): Snow decided to go for a forward 10 gate. As zealots kept being rallied to the base, Mong slowly started losing more workers and marines. About 5-6 workers were killed getting the factories up alone. By the time the zealots were cleaned up, Mong was down to 8 workers. His single vulture managed to do no damage promoting him to type out. 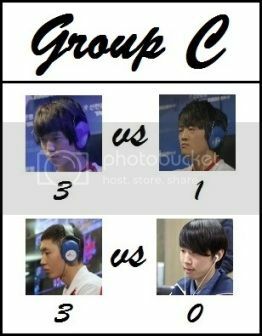 Game four (Neo Electric Circuit): 2 gate goon from Snow went up against the 2 fac of Mong. Snow was able to constantly push back Mong's force. He harassed Mong with a reaver as he double expanded while Mong took his inbase mineral only expansion. As the game went on, both players would harass each other's mineral only expansion using the back entrance. Snow would establish a 4th and 5th base as he harassed Mong's expansion eventually taking it down. With some recalls, Snow ended up denying mining at Mong's newly established 3rd base and establishing a 6th base. 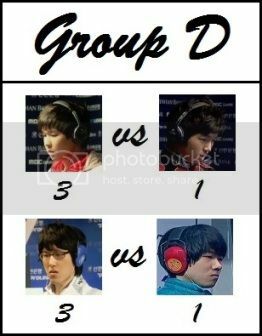 He eventually attacks into Mong's army after the 3rd is re-established to win the game and series 3-1. Series 4- Free vs Larva: Larva has destroyed freedom! Game one (Fighting Spirit): Larva went for a hatch before pool against forge FE from Free. Both players were able to grab their third though Free almost had his denied. Larva grabbed a fourth and focused on a hydra+lurker combination to counter the heavy goon/ht force of Free (pic). After many battles and several bases taken by either player, Larva was finally able to take down Free's 3rd base leaving him with one mining base. Soon after, Larva ended up finishing the game after he managed to wipe out Free's army to go up 1-0. Game two (Circuit Breaker): Larva went for pool first then double expanded due to Free forge FEing. Small skirmishes took place at Larva's bases before Free attacked the expansion with a zealot heavy/single archon force. Larva repelled this and worked on denying Free's third. His mutalisk harass kept Free's third from mining, sniped a lot of hts and helped defend when needed. Things seemed to be going Larva's way as he grabbed a fourth. Free ended up grabbing his own fourth with Larva grabbing two more as the game entered the late stage. Free eventually found a gap in Larva's defense as he attacks into Larva's third but he loses his whole army. The game ended after Free lost his 6th base and decided to attack with his heavy zealot army into a position heavily fortified with lurkers. Game three (Blue Storm): Larva decided to change things up going for 9 pool into mass zerglings all in. Free played safe with a forge FE with 2 cannons to start. 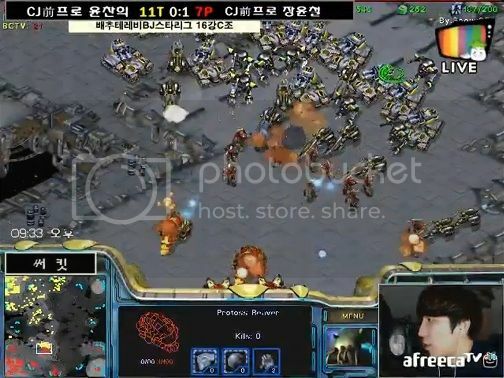 After scouting the lack of drones, Free ended up adding a third cannon and blocked both zergling attacks to win a quick game making the series 2-1 in Larva's favour. Game four (Neo Electric Circuit): Larva opened with hatch first and grabbed a quick third to counter free's forge FE. Both players seemed content sit back and play for the late game as Larva teched to mutas and grabbed his inbase expansion. On the other hand, free went for templar archives foregoing corsairs all together and defended muta harass with archons. An attack on Larva's 4th was stopped and Free's army was taken out after he overcommitted in another attack on Larva's 2nd. 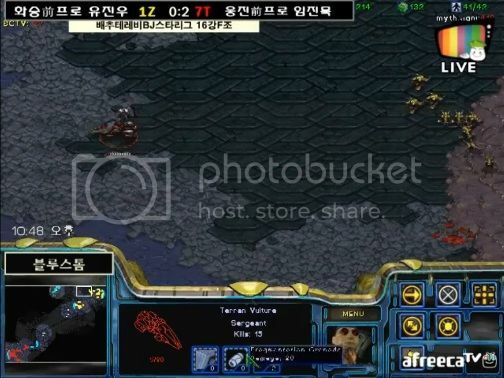 Eventually, Free managed to take down Larva's 4th however Larva's constant zergling attacks kept him on the backfoot allowing Larva to recover. After Free established his 4th and defended many attacks (Larva also lost drones to dts and 2 shuttle zealot drops), he gg'd giving Free the win. Game five (Fighting Spirit): Free went for proxy 2 gate to Larva's pool first. 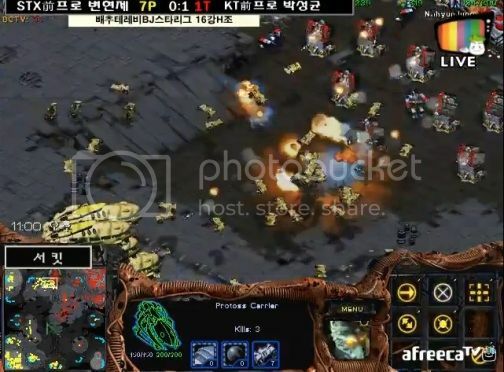 Larva ended up scouting the two gates and prepared by sending his zerglings to Free's main taking out several workers while preparing a sunken at home. He ends up go for a hidden hatchery himself while taking his natural. He eventually gets mutas grabbing his fourth and keeping Free in his main. Until he lost his mutalisks, he kept on harassing workers and sniping hts to keep Free's army small. Larva eventually takes full advantage of his situation and quadruple expands to go up to 9 bases on FS fortifying each with a gazillion sunkens though his main and original exp were vulnerable (same for another base) which he ends up losing doing this (pic). Eventually, Free realizes that there isn't much he can do to win and decides to attack into 10 sunkens with a 200/200 zerg army coming from the back (pic). 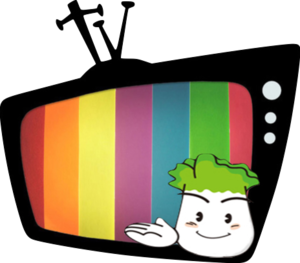 With that, Larva wins the series in classy fashion! Series 5- Killer vs Pusan: Call the Police, a Killer is on the loose! Game one (Fighting Spirit): Killer ended up going for 9 pool speed which ended up giving him a quick victory since Pusan had a late cannon after forge FEing. Game two (Circuit Breaker): Killer opened with a hatch before pool and went for a quick third. Pusan opted for the usual forge FE. Killer ended denying some of Pusan dt drops by controlling the air though a dt at Killer's third managed to kill 8 drones. After Pusan established his 3rd and 4th with some resistance, he attacked Killer's natural while Killer countered attacked into Pusan's natural. Losing his whole army due to good simcity and lurker positioning, Pusan would go on to lose his 3rd and 4th due to cracklings+dark swarm eventually tapping out with Killer going up 2-0 in the series. 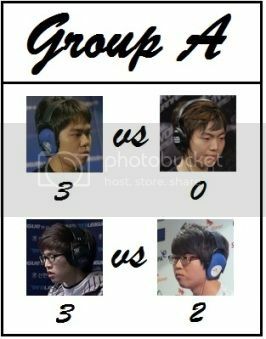 Game three (Blue Storm): Pusan looked for the late game while Killer went for pool first. A zergling runby managed to kill several probes before it was cleaned up. As Killer established his third, Pusan looked to pressure him but was denied by hydras+sunken. Killer tried to attack Pusan's expansion with mass hydras but was repelled. Lurkers were effective in delaying the expansion for a bit before Pusan got obs and was able to meet the Hydra force head on and crush it. With that, he established his third, re-macroed up another army and looked to take down Killer's fourth. He swung his army around Killer's army taking the high ground and with some very impressive storm, not only crushed Killer's army and fourth but had enough to attack the expansion with Killer calling the gg soon after. Game four (Neo Electric Circuit): Similar strat to game three. Killer grabbed the inbase expansion as his third and went up to six hatcheries adding a hydra den and spire at the same time. Pusan went for sair/reaver and looked to pick off some overlords. Dt and ht drops from Pusan failed while Killer established his fourth and fifth. Pusan also tried to establish his fourth but was constantly denied. After macroing up a big army, Pusan went for an attack on the 4th. What looked like a promising battle soon turned into a massacre as Killer managed to surround and kill every little bit of Pusan's army (pic). With the zerg army descending upon his expansion, Pusan gg'd to give Killer the series 3-1. Series 6- Beast vs PianO: PianO to play Beast the song of defeat! Game 1 (Fighting Spirit): 2 hatch muta went up against 1 rax FE. Beast killed lots of workers and kept PianO from moving out far from his base while establishing a third. PianO noticed the heavy muta emphasis and went for valkyries eventually pushing with a large MnM force+valkyrie to beast's expansion. This forced beast to use everything he has to save his expansion. With beast losing his army including his harassing guardians (he has 2 killing workers at PianO's expansion), he tapped out losing the first game. Game 2 (Circuit Breaker): PianO failed a bunker rush as beast went for 3 hatch muta. PianO went for some MnM harass and was undeterred by the mutas. Beast realizing the situation pulls his mutas back to defend his expansion. He manages to save it and push the MnM force back though after more marines joined the group, beast was unable to defend and had to give the game to PianO who went up 2-0. Game 3 (Blue Storm): PianO went for the 1-1-1 against beast's expansion first build. Using several marines and an SCV, PianO got beast to pull off drones to defend resulting in several drone casualties and delayed mining. In the meantime, PianO got his factory to pump vultures and port for wraith. The first vulture barely missed 4 zerglings and made it into beast's base where it killed a total of 4 drones and 11 zerglings (pic). After it was cleaned up, beast countered with pure zerglings but spider mines killed them all. Using a dropship, 4 vultures were ferried into beast's main where they ripped drones apart for the gg giving PianO the series 3-0. Series 7- hero vs Sky: Clark Kent can finally fly! Game 1 (Fighting Spirit): 2 gate from Sky against pool first from hero. hero scouted and defended the 2 gate then teched to mutas. Sky decided to expand. With the mutas, hero constantly denies mining and kills lots of goons and a corsair before gg is called. Game 2 (Circuit Breaker): Sky opened 1 gate expand against a pool first from hero. hero looked to be in command as he grabbed a third, denied Sky's zealot harass and won an engagement however Sky soon turned things around. Within a minute, half of hero's drones were massacred by a combination of 2 dts and some hts from a Shuttle at hero's main, natural and third. Though Sky was down one base, his positioning, storms, constant harass and constant denial of hero's fifth base allowed him to eventually take his own fifth and take the lead. 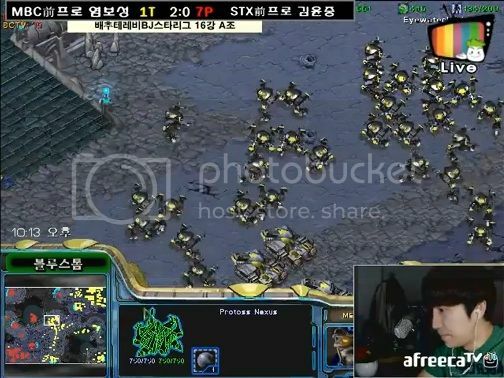 hero was caught off guard (army at 5th base) as Sky attacked into his expansion forcing the gg to tie up the series 1-1. Game 3 (Blue Storm): hero opened with pool first against Sky's forge FE. hero responded with his own third after scouting. Zealot harass was shut down with minimal damage. Sky looked to transition into sair/reaver while hero opted for hydras with scourge for corsairs. As hero's army grew bigger, Sky kept him busy chasing the corsairs which took down a lot of overlords where he established his own third and macroed up a big army. The big engagement happened outside hero's third. Despite having reavers and several hts for storms, Sky's army was still overwhelmed as hero managed a surround and crushed the army to win the game and go up 2-1. Game 4 (Neo Electric Circuit): Pool first from hero against the forge FE from Sky. hero once again decided to double expand after scouting Sky. Sky decided to go for 2 stargate 2 robo corsair/reaver composition. After Sky grabbed his third, it was taken out shortly after by mutalisks with scourge protection leaving hero two bases up. Sky decided to make things interesting as he got disruption web and together with reavers, managed to wreck havoc in hero's inbase expansion as he re-established his third and took a hidden fourth (pic). The game seemed to spin out of control for hero as soon after, Sky started pumping out Carriers, 4 at a time. Despite hero going for mass hydras, the combination of corsairs with disruption web, reavers and carriers proved to be a lot to handle. To counter, hero decided to hit Sky's eco by hitting his main but lost a lot of OLs in the process. His new strategy revolved around burrowed hydras. He tried to push the carriers over them and managed to surround the carriers. The combination of hydras+lots of scourge proved to be too much for Sky. As he lost most of his army, he taped out and hero won the series 3-1. Series 8- Mind vs Mini: Mini was mind controlled to lose! Game one (Fighting Spirit): A FD from Mind managed to push back goons from Mini after he 1 gate expanded however once an obs was out, Mind had to retreat. While this was going on, Mind expanded and went up to 3 facs compared to mini's 3 gateways+robo. Mind ended up moving out with a control of units and pushed Mini back to his expansion with mines and tanks. Mini lost almost all his goons and the reaver as well losing the game. Game two (Circuit Breaker): 1 rax FE against nexus first with 2 gate following shortly after from Mini. Mini tried some shuttle harass as he expanded to his third but was denied. Mind decided to expand around the same time matching the protoss base count then pushed out with about a control group of units consisting of mostly tanks and 4 goliaths. He managed to do a lot of economic damage to Mini's third despite losing the small army. In the meantime, he expanded to grab his fourth, so did Mini. From this point on, Mind's constant vulture harass and high goliath count (his army was 80-90% goliath lol) helped him to clean up the carriers while a small squad of 4 tanks destroyed Mini's fourth. Mini's fifth was also scouted and taken out leading to Mind having a base advantage and eventual GG from Mini. Game 3 (Blue Storm): Fake double from Mind to Mini's 1 gate expand. Some zealot harass occurred by was stopped by Mind. Mind tried to push but had to stop due to goons on the high ground. Mini eventually took a third and prevented Mind from doing so for a long time even breaking through his siege line to do some major damage to his eco at his expansion (spider mine dragged into workers). Even after establishing his third, Mind felt too behind since Mini has already gotten a 4th and gg'd out to give Mini his first win. Game 4 (Neo Electric Circuit): Nexus first from Mind vs factory expand from Mini. 2 gate were added after the nexus with Mini being aggressive though subpar control made him lose most of his small army against the marines+vultures. Both players sat back, took more bases with Mind keeping up with Mini till four bases. After this, Mini triple expanded however only one of the base was saturated when Mind decided to push out at 200/200. The major engagement went in Mind's favour as his tanks melted the zealots and he emp'd all three arbiters rendering them useless to cast spells. Within a couple of minutes, Mind managed to take out 4-5 bases of Mini reducing him down to 3 bases. Mini's army and recall were not enough to stop Mind's army and he gg'd giving Mind the win and the series, 3-1. 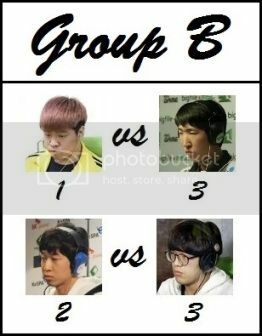 Overall, we have 4 terrans (Sea, sSak, PianO and Mind), 3 Zergs(Killer, hero and Larva) and the lone protoss Snow who advance to the RO8. Groups have been posted but dates that the groups are played on have yet to be finalized. A preview of the groups may be posted in the upcoming days. Happy reading! Good read! Thanks for doing this =) Time to get down to some recommended games. where can i find the vods for this? i'm getting the itch to watch some BW! Especially want to watch Sea in action! LiquipediaSouma: EU MM is just Russian Roulette. Literally. You forgot to include Python in that poll for everyone still on iccup and bw-west / bw-east. Hopefully we'll see them play even more funky maps. I remember seeing a sponsored game on an island map between Sea vs Shuttle (I think) a while ago. It was really interesting to see how they played differently. I think Sea took it though due to being able to siege from the low ground lol. Where is Bisu these days? Still not participating in tournaments?